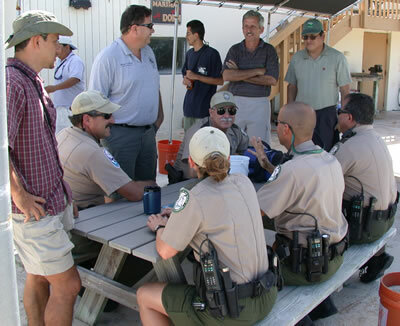 Hosted by The Gulf and Caribbean Fisheries Institute, Inc. The use of MPAs has become increasingly popular in the wider Caribbean region as a tool to improve MPA management, conserve marine biodiversity, address overfishing impacts, decrease user conflicts, and provide economic alternatives to local coastal communities. This has resulted in substantial knowledge gained on optimal site selection and design, successful outreach approaches, effective management strategies, and appropriate methods to evaluate their effectiveness. Difficulties in exchanging information on lessons learned continue to constrain informed decision-making due to the geographic, socioeconomic, and cultural complexities of the Caribbean region. At the same time, communication among professionals has become progressively more vital given the increasing scientific interest in the examination of biophysical connectivity across the region. As MPAs continue to be proposed and implemented, the efficient exchange of information is now more critical than ever. CaMPAM capacity building program includes training and communication tools to expedite knowledge and lessons learned transfer across the region. CaMPAM was created in 1997 under the framework of the Caribbean Environment Program of the UN Environment Programme (UNEP-CEP) and the Specially Protected Area and Wildlife (SPAW) Protocol of the Cartagena Convention activities. Since then, it has received the support of governments, private foundations, and individual experts. This initiative brings together MPA researchers, administrators, managers, and educators from governmental entities and non-governmental organizations as well as the private sector in an inclusive network to exchange ideas and lessons learned through a variety of mechanisms. CaMPAM is guided by an Executive and Leadership and Resources Team that identifies strategic objectives and provide leadership and resources for the Network, and is comprised of partners, and MPA practitioners and marine conservation scientists. Georgina Bustamante (bio) has served as the CaMPAM coordinator since 2008, served as Executive Team lead, and has contributed to several of the training and communication activities. The Caribbean Challenge is a large-scale initiative advocated by a number of governments and regional and international organizations which aims to protect 20% of the marine and coastal habitats of Caribbean countries associated with the initiative by 2020, including The Bahamas, the Dominican Republic, Jamaica, Saint Vincent and the Grenadines, Saint Lucia, Grenada, Antigua and Barbuda as well as Saint Kitts and Nevis. The Nature Conservancy has invested 20 million dollars in return for a commitment from Caribbean countries to support and manage new and existing protected areas. In support of the Caribbean Challenge, UNEP-CEP is coordinating a project funded by the Directorate General for Development Cooperation of the Italian Ministry of Foreign Affairs entitled: "Regional support for the Caribbean Challenge initiative: Networking, consolidation and regional coordination of MPA management". This 2-yr project focuses mainly on countries associated with the Caribbean Challenge, but will also benefit other Caribbean countries. 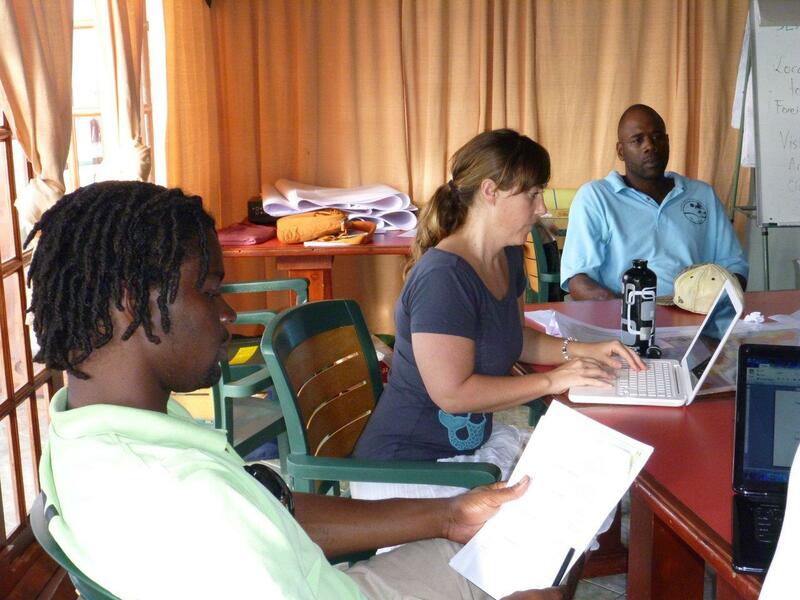 The aim of the project is to support the development of a biologically-representative, functional network of marine protected areas (MPA), capable of adapting to climate change in coherence with the SPAW Protocol objectives and those of the GLISPA initiative and to assist the countries in meeting that Caribbean Challenge objective. These activities are continuously evolving to meet the specific needs of the countries and organizations of the Caribbean Challenge and to address the needs of the specific GEF projects. For more information about the Caribbean Challenge, please visit The Nature Conservancy, the Global Island Partnership (GLISPA), and UNEP in the GEF, and the SPAW Regional Activity Center web pages. Additional information may be found here. Communciations is at the core of the CaMPAM mission. Through a number of approaches, CaMPAM has developed a number of tools to esnure that communications among members is comprehensive yet unobtrusive. CaMPAM communication tools include an email list and forum that disseminates information relevant to MPA scientists and practitioners such as grants and jobs opportunities; requests of information; conference announcements; new web sites; webinars; new reports, books and tools; request for proposals; research information; etc. CaMPAM List disseminate messages from other relevant Internet Lists and web sites (GLISPA Discuss; Caribbean Assessment, IRF News, CEO-GEO, WCPA N America and Caribbean, GCFI, etc.) as appropriate, and all messages are archived and readily accessible to subscribers. 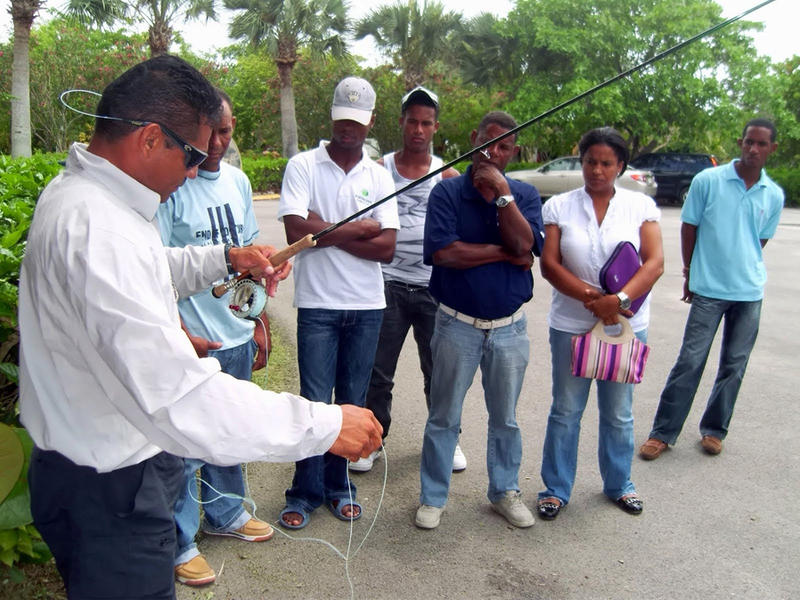 In addition, CaMPAM coordinates and sponsors sessions and workshops at the Annual Meetings of the Gulf and Caribbean Fisheries Institutes, where fishers and MPA managers discuss emergent issues, present papers and get exposed to the latest news on marine science in the Wider Caribbean and the world. A virtual library with several dozen freely accessible publications can be browsed by title and their pdf files downloaded. English, Spanish and French comprise 8 modules on Caribbean MPA planning, stakeholder participation, management, research, monitoring and regional policy, along with communication and teaching skills. For more information, you can access the program's 2007 independent assessment, and the reports of the 2009, 2010, and 2011 regional courses. The training of trainers courses meet each year within the region alternating between English and Spanish speaking locations. The courses are taught in the language of the host country. Individuals selected for the course are required to develop follow-up activities within their home countries. The purpose of the CaMPAM database is to provide a resource detailing the numerous marine protected areas in the region, and to make that resource accessible to those interested in examining a number of variables. The database is comprised of 77 fields focusing on identity, legal, biophysical and management parameters. The Database is becoming a standardized repository of detailed information for Caribbean MPAs and a resource for producing regional analyses and periodic reports. Future plans include developing interactive maps. 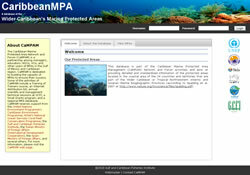 CaMPAM is currently populating the database with full and up-to-date information about the region's MPAs. As one of the activities being coordinated by CaMPAM for UNEP-CEP and the Caribbean Challenge, we are currently working to verify and complete the information in the database about the MPAs in the countries associated with the Caribbean Challenge. In doing this, we rely on data provided by MPA managers, government officials, NGOs and scientists associated with the MPAs. We greatly appreciate their assistance in working with us on the database and in making data available. Supported by the SPAW Programme of UNEP-CEP and its Regional Activity Center (SPAW-RAC), the Small Grants are funded by several foundations and institutions including the government of Italy (Directorate General for Development Cooperation of the Italian Ministry of Foreign Affairs), the government of France (MPA Agency), and the government of Sweden (Swedish International Development Agency, SIDA). The Small Grants Fund is administered by GCFI to promote sustainable MPA and fisheries practices, as well as to promote alternative livelihoods for local communities. The fund also forms part of the CEP/SPAW initiative to develop adequate management plans and programs for priority species of regional concern, including those of economic value. One of the interesting aspects of the Small Grants Fund is that it provides an opportunity for exchanges between countries, MPA sites and communities so that resource managers and marine users in the Caribbean region can share lessons learned and benefit from each other's experiences. The following section provides a summary of some of the projects and exchanges that have been achieved in recent years through the Small Grants Fund. In 2010-2012, the Program focused on the Insular Caribbean countries associated with the "Caribbean Challenge", funded by the Directorate General for Development Cooperation of the Italian Ministry of Foreign Affairs. The CaMPAM Mentorship Program for Caribbean MPA managers and practitioners started in 2013 with a consultation meeting with 8 senior marine resource professionals from around the Caribbean. They are serving as mentors of junior MPA officers and assisting CaMPAM to guide the program. In mentoring programs, mentors demonstrate, explain and model while protégés (mentees) observe, question, explore and apply new skills. The primary goal of the CaMPAM Mentorship Program is to sustainably enhance MPA manager/practitioner competencies in the Wider Caribbean through the development of mentoring relationships that respond to common and emerging training, capacity building and technical assistance needs. Download a program fact sheet and the mentors' biographies to learn more about how your MPA could benefit from this exciting new program. Stay tuned for announcements on new mentoring opportunities through the CaMPAM List [subscribe here]. To provide key information to CaMPAM about MPA management capacity needs in demonstration sites to guide programmatic planning and services such as training, funding, and technical support. The consultant team gathered information from 1-3 sites in the following jurisdictions: 1. The Bahamas 2. Belize 3. British Virgin Islands 4. Grenada 5. Honduras 6. Mexico 7. Saba 8. St. Eustatius 9. St. Lucia 10. St. Vincent & the Grenadines 11. Turks and Caicos, The assessment results were completed and compiled into a final report and are now available online in both an online book version and a pdf file. Currently, the focus has been on P2P projects that focus on the highest priorities identifuied within the Capacity Assessment.